I started by cutting out the largest scalloped oval in Pool Party and the largest smooth oval in Whisper White. I torn some scrap paper and masked off an area for the snow at the bottom of the scene. To make the moon in the background I stuck some washi tape on scrap paper, punched out with the 1/2″ circle punch and then stuck down on the background. I created the background by sponging on fist a layer of Pool Party Ink followed by a very light layer of Island Indigo. I then took removed the washi tape circle and then stamped the three tree stamp in black archival ink. I created a card blank from Pool Party cardstock and then embossed a panel of Whisper White cardstock with the Softly Falling Textured Impression Embossing Folder. I then finished the card off with a length of Pool Party Stitch Satin ribbon. I really love how this card tuned out. As you can see they all use the tree outline die as a basis for the tree in Soft Suede cardstock and then for Spring, Summer and Autumn I have just stamped a different coloured tree top depending on the season. For the Spring leaves I used a base of Pink Pirouette ink and then over stamped in Blushing Bride, the grass is Emerald Envy and the birds have been stamped in Early Expresso. For the Summer tree the leaves were stamped in Mint Macaron and then over stamped in Emerald Envy and the apple are of course…Cherry Cobbler. For the Autumn card, which I think is my favourite the base leaves were stamped with Delightful Dijon and then a layer of Cajun Craze. The birds were stamped again with Cherry Cobbler. The Winter card is probably one of the easiest cards I’ve ever made but I still like the simplicity of it. It’s simply the Soft Suede die cut placed on the stamped background of Soft Suede. I thought about adding a greeting to these cards but I decided o leave them super simple, what do you think? 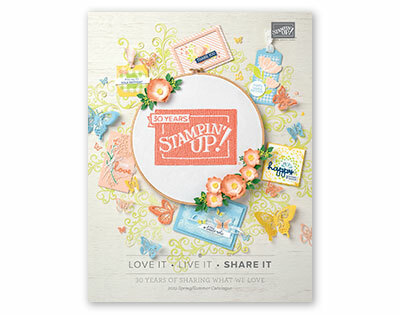 By now you’ve probably all seen the Thoughtful Branches Promotion that Stampin’ Up! is running throughout August. 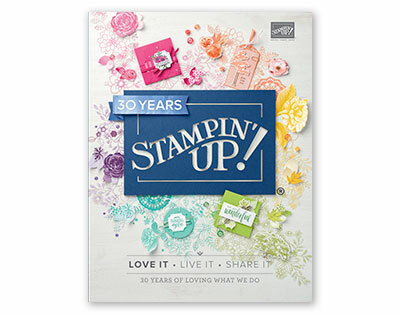 Pick up this limited time stamp set on its own or in a bundle with the matching Beautiful Branches Thinlits Dies, but hurry as this stamp is only available till the end of the month or until stocks last. As you can see my first card with this bundle uses the stamps and dies to create a purple hydrangea flower, variants of which can be see all over the internet. I love the Blooms & Bliss designer paper so decided to use that as inspiration. I used Sweet Sugarplum and stamped the flower image multiple times just moving slightly to create a mottled background for the flower, similar to that on the paper. I then over-stamped in Rich Razzleberry for definition. The leaves and stem were die cut from Mint Macaron and the greeting is stamped in Rich Razzleberry also. A little sponging around the edges and a few of the tiny pearls finishes the card off. Comeback tomorrow for more inspiration with this bundle. Yes that’s right I’ve CASE’d it right from the catalogue example on p119. I’ve used a different colour scheme and substituted the black metallic twine for Melon Mambo thick baker’s twine. I’ve wanted to try shaker cards since this catalogue launched as there are loads of fabulous products which make them quick and easy, especially the new sets of layering Framelits and the foam adhesive strips which seal up the sides super quick. Here’s a close-up of the shaker part and as you can see I haven’t got the foam adhesive 100% correct as my sprinkles were sticking to the edges, any suggestions on how to improve this gratefully received! dibbystamps@gmail.com and I’ll pop one in the post to you.